Isaac recently joined Boy Scouts Troop #1 in Meridian. This troop has been in continuous operation since 1917, and meets at and is chartered by the local American Legion chapter. The leadership is fantastic, and they have a great group of boys in the troop. This past weekend was the annual Willow Creek competition camp, and was Isaac’s first camp with this troop. I decided to go along with him for this one, and I’m glad I did. The camp was a ton of hard work, but very fulfilling and worth the effort. We arrived Friday early evening having already eaten dinner. The senior patrol leaders (yep, his troop actually uses the patrol method) had already been up to the site earlier in the week to put up the large mess tent and set up all the tents for the scouts to use. So, Isaac just needed to find which tent he was assigned and get himself settled. I had to pitch my tent (which I wound up sharing with another dad, which was fine because it’s a HUGE 8-man tent with plenty of room) and then we headed off to the bonfire. So this campout is what is known as a “competition camp” – something I’d never heard of before. There were 20 or so troops there from all over Idaho and 1 from Bend, OR. There were also 3-4 explorer units involved. 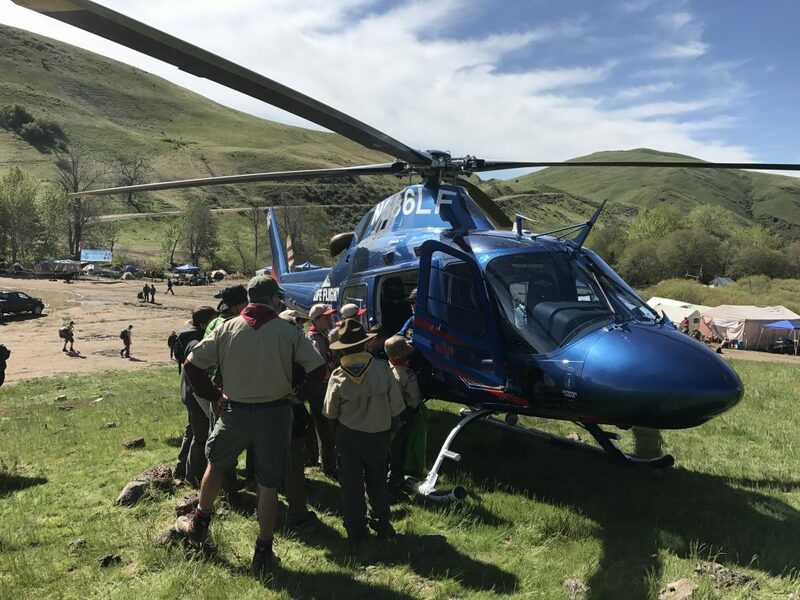 There were a LOT of scouts there…. something like 225 boys all together. 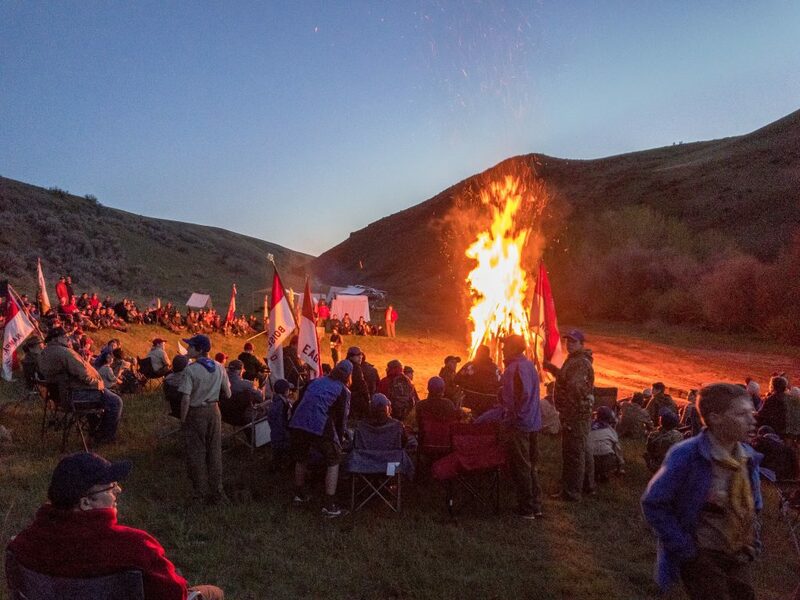 I mention these numbers so you can sort of get a feel for the sheer scale of things… imagine 225ish boys and about 75 adult leaders arranged in a huge semicircle around a pile of pallets and other scrap wood that was easily 20 feet tall and 15 feet across at the base. Then picture a vintage civil war canon firing at exactly 9 pm right over everyone’s heads while a crazy scoutmaster throws a lit flare at the base of the kerosene-soaked aforementioned massive pile of wood. Everyone had to back off around 100 feet from the fire because it was literally a towering inferno and WAY too hot to even approach. It was easily the biggest bonfire I’ve ever seen. Various troops took turns doing skits in the no-man’s land between the edge of the fire and the distance away from it where the heat was tolerable. The skits were all short, and some were even pretty funny… though it was hard to hear them over the sheer noise of the fire. After the bonfire we all retired pretty quickly because we had to be up at 5:30 to start preparing for the competition day on Saturday. 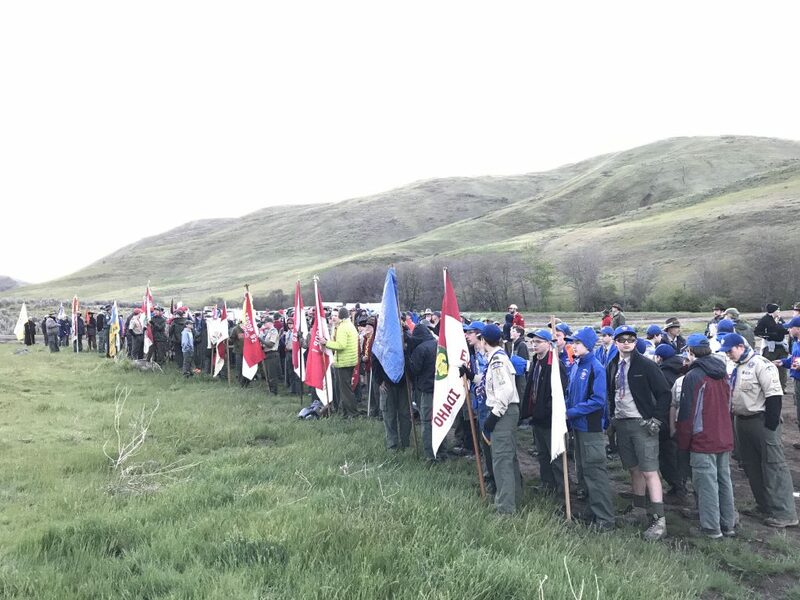 We started with a flag ceremony / welcome / orientation from the event organizers at 6, then headed back to our campsite to have breakfast and prepare for site inspection (part of the competition). At 9 sharp everyone assembled back at the flag ceremony area to receive their orienteering maps for the day and the competition was officially underway. 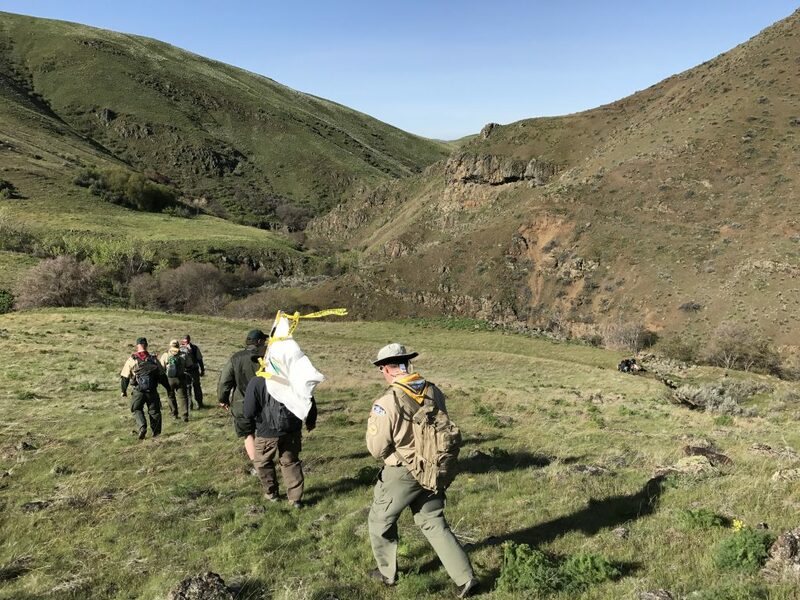 I decided to join an adult patrol to run the course the same way all the scouts did. This accomplishes more than half of what has to be done in case I ever decide I want to be an assistant scout master or fill other leadership roles in the troop. The gist of the competition was like this: You’ll be given a topographical map and a list of a series of waypoints in the form of compass degrees and distances. Use your compass to plot a waypoint on the map, (adjusting for declination away from true north to magnetic north, etc) and then hike to that waypoint. You should find one of the 10 stations there where you need to perform a skill. There were stations for knots and lashings, first aid, flag ceremonies, rifle shooting, fire building, an obstacle course, civil war re-enactment, scout knowledge, and some others I’m forgetting. Once you perform the skill or accomplish the task at the station you’ll plot your next waypoint with your map and compass and head off to the next one. The hardest part of all of this was getting the points plotted on the topo map correctly and then finding the stations there. The area was mountainous with lots of steep hills, sharp corners, hidden ditches, etc. Of course, unless you were pretty accurate with your orienteering, you’d never find the stations. Hiking to our first waypoint. The boys worked in their own patrols, and the adults worked together in their own patrols. By noon we had only finished up 3 of the stations, and the camp organizers started passing along the word that it was no longer necessary to find all the stations in order – just try to get to them all. So we stopped messing with the mapping and used a cheat-sheet map that they provided that had all the stations marked. We did manage to get to all of them before the course closed at 5:30, but just barely. In short, it was a long, hot, hard day. We hiked around 6 miles all together, and learned about and performed all the scout skills I’ve ever heard of. In talking with Isaac, his patrol did not fare quite as well as our adult patrol did. They didn’t get to all the stations, and he was particularly disappointed that he did not get to the rifle range (it was the furthest away from everything and the highest elevation). But, he did seem to have a good time overall and is enjoying getting to know the boys in his troop and patrol. We had another massive bonfire on Saturday evening, again with skits and lots of fun jokes etc from the boys running the show. At the end of the bonfire fun, the event was changed into a flag retirement ceremony. In all the years I’ve been involved with scouting in various ways, I’ve never seen one of these: It’s when a US flag has reached the end of its serviceable lifetime and needs to be destroyed. Each troop was given a flag to retire, ranging in size from 50 feet across to maybe a dozen feet across. The first troop formed a color guard, carried the flag over to the fire, unfolded it to its full size, then everyone would salute as the flag and recite the pledge of allegiance. Then the flag was carried over the top of the fire and lowered over the fire like a blanket. Salutes were held until the flag was completely destroyed, at which point the next troop’s color guard would march forward and the process would repeat, omitting only the pledge. It was an extremely solemn and respectful ceremony, and really touched me. 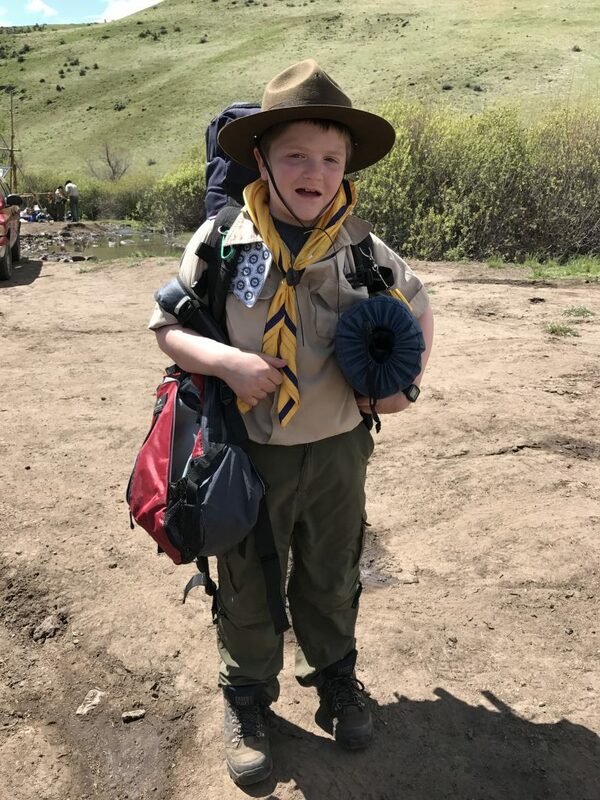 Isaac was not selected to be in his troop’s color guard, but I spoke with the scoutmaster after the camp and he was surprised I’d never seen one of those before. He says that the troop does it at every campout, and Isaac will get plenty of opportunities to participate. Sunday started bright and early with another flag ceremony, then breakfast, then a non-denominational church service that featured a guy with a guitar singing generic christian soft-rock songs in the rain. That was followed by a brief sermon about god’s love for us. In talking with Isaac about it afterwards, he said that it was sure different, but that he liked the stories in the sermon. After lunch we had a closing awards ceremony and flag ceremony, then packed up and headed home, exhausted. While Isaac’s troop did not win any awards in the competition, I’m really impressed with how well organized and run the troop is – especially since the troop is very focused on having the boys run everything. They organize the meals, they collect money and shop for the food, they make sure everyone has all the right gear, they run the camp and get themselves where they need to be when they need to be there, etc. The adult leadership is really just there for safety and to make sure things are running smoothly. There was very little I needed to do other than try to keep up with the boys. Isaac is looking forward to the next campout. Tired and dirty, but happy and ready to go home. If you would like a free copy, all you have to do is ask! 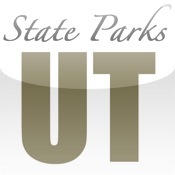 I’m happy to give out as many free copies as Apple will allow… so if you visit state parks and want to have an awesome guide to all the parks in UT in your pocket for free – just contact me! The best way is to follow the instructions in the “Contact Me” tab at the top of this screen.